Yesterday was a tough workout day after the whole gormandizing on the christmas weekend. 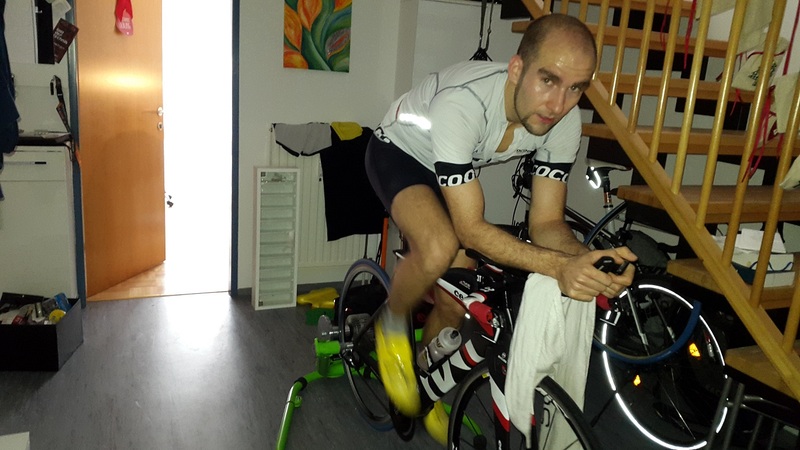 In the morning I did the first FTP test on my Cervelo P5 with my new Power2max type S on my new (secondhand) Kurt Kincetic Rock and Roll after I have cancelled the last attempt on mid of December. 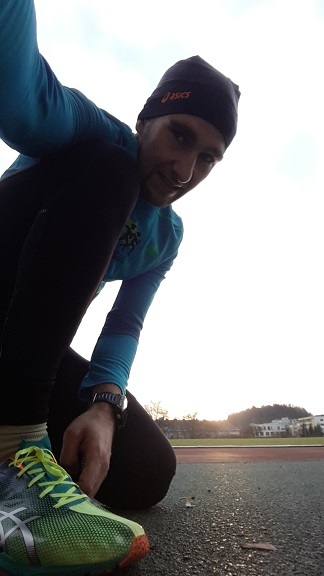 In the afternoon I did three fast kilometers on the track. In the evening of course some recovery session. 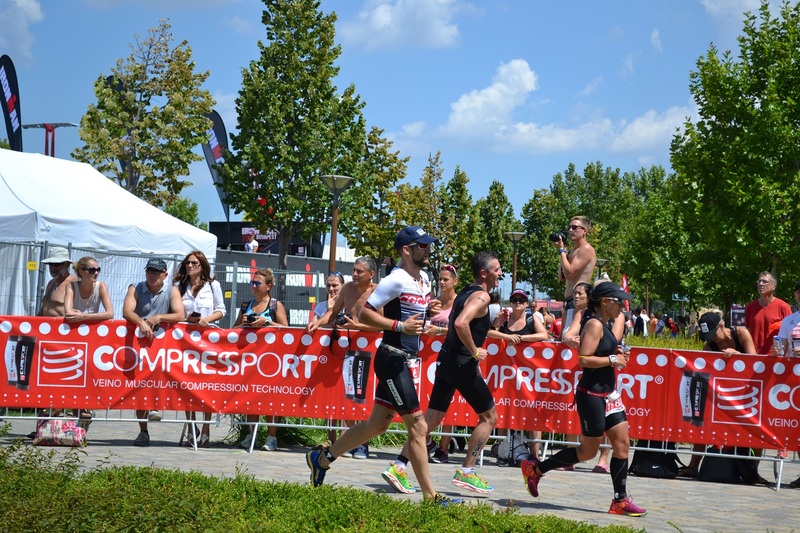 Last saturday another highlight of this years season took place: Ironman 70.3 Budapest. Even tough this race has only been in the race calendar for the last two years I have heard so much positive about it. At 9:10 in the morning, a little bit late than planned, the race was started by the men pro athletes. 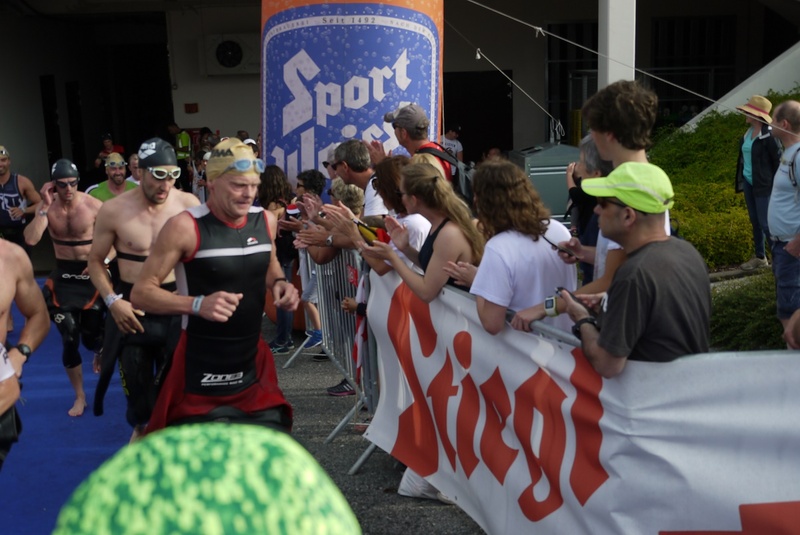 My expectations to my second rolling start in this year were pretty high because in Klagenfurt this new system did no work out as well as the organizer had expected, especially the separation where an athlete has to start was pretty poor at the Ironman Austria. The decision where to stand (I took the second wave with an expected swim time of 30 to 32 minutes) was easier than in Klagenfurt but nevertheless the rolling start turned out to be a mass start, as the girls in front row opened the “gates” almost every second for eight or more athletes. The result was a hard fight on the first 200 meters. After that the swim became a bit easier and on the way back it was a nice swim. After exact 30 minutes an 41 seconds I came out of water. After a quick jump out of the neoprene and into the aero helmet the bike split was ON. The course was very nice even tough there were a lot of potholes and bumps which lead to defects on many athletes’ bikes – happily I did not have any troubles except one time when I almost fell of the aero bar after five kilometers of the race. First lap on the bike passed by very quickly. At the beginning of the second lap I was wondering where all the other competitors were who have been racing among me during the first 45 km. At the first turning point I figured out that they were behind me all the time for the first 10 km. This fact did not bother me very long and I kept pushing forward. Two hours and 18 minutes after the transit to the bike I was back in transition zone for the switch to the running part of today’s competition – at this time it already had about 30 or more degrees Celsius. 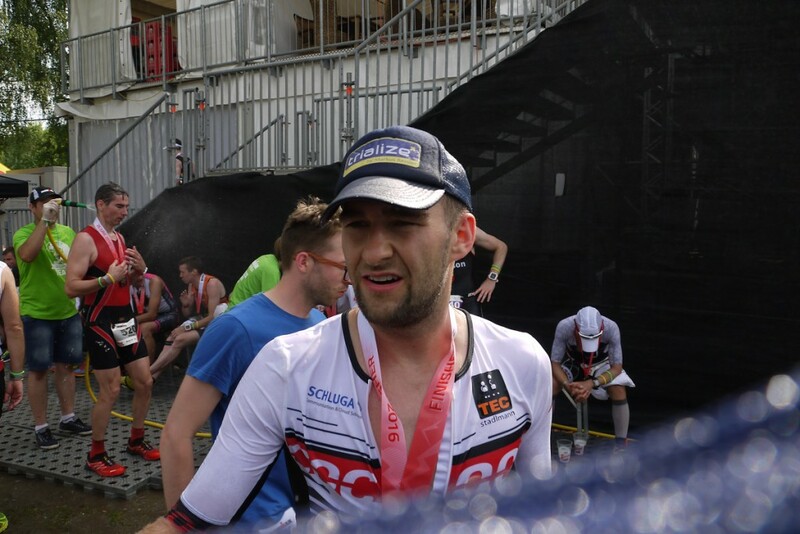 I chose my pace from the beginning on with 4:30 min /km and tried to keep it up as long as possible – did not succeed on that plan but I could however finish the half marathon within 1 hour and 35 minutes. My time at the end was 4 hours 28 minutes and 46 seconds which makes me very happy and a bit proud on myself. 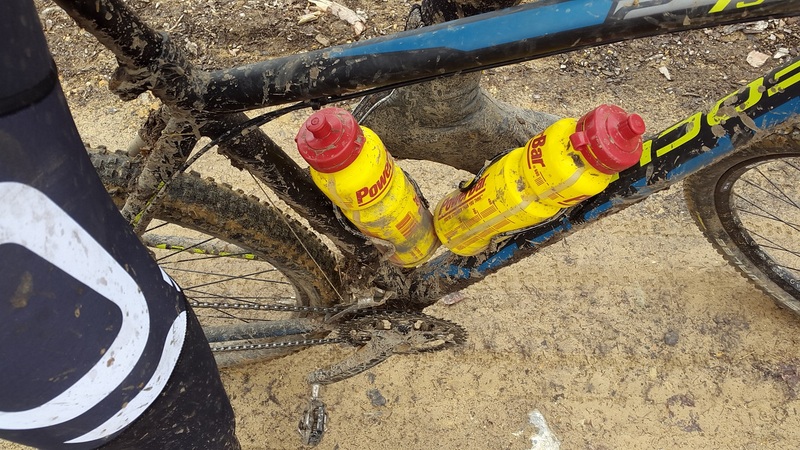 All in all this means the 24th place in the agegroup M30-34 and the 88th place among men. 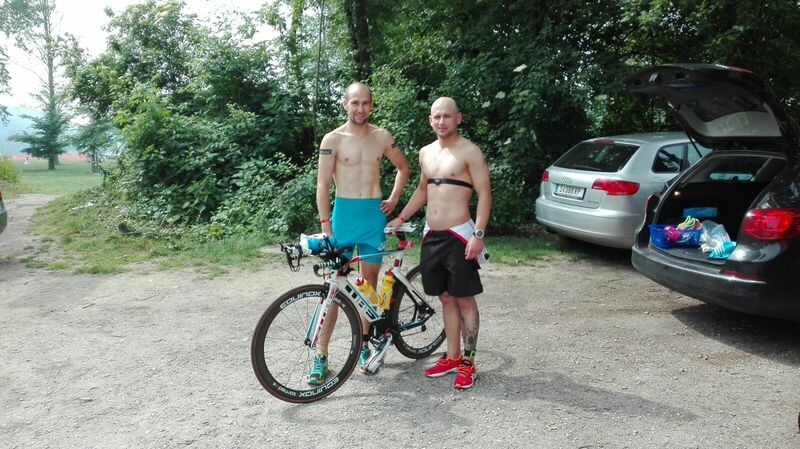 Additionally I have to mention that both the bike (5km) and the run (1km) course were too short. But nevertheless I am happy with my time and the results at this hard circumstances. Further results can be found here. Thank’s to the organizers and also to the many helpers for the great competition and the people cheering at all the athletes. Also many thank’s to Eni for the very nice pictures. Now it is again time for relaxing and putting hot feet into cold baths (unhappily still without Aquilo Sports). 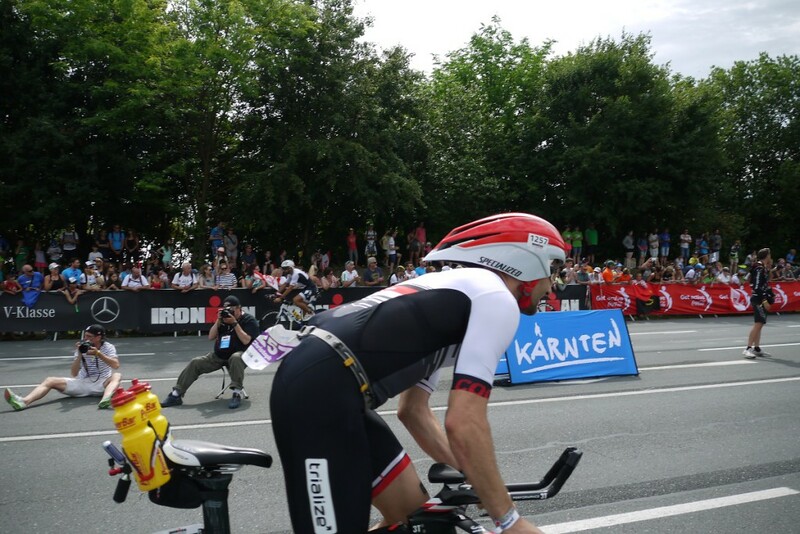 Last Sunday the Ironman Austria in Klagenfurt or my declared season highlight was on the schedule. 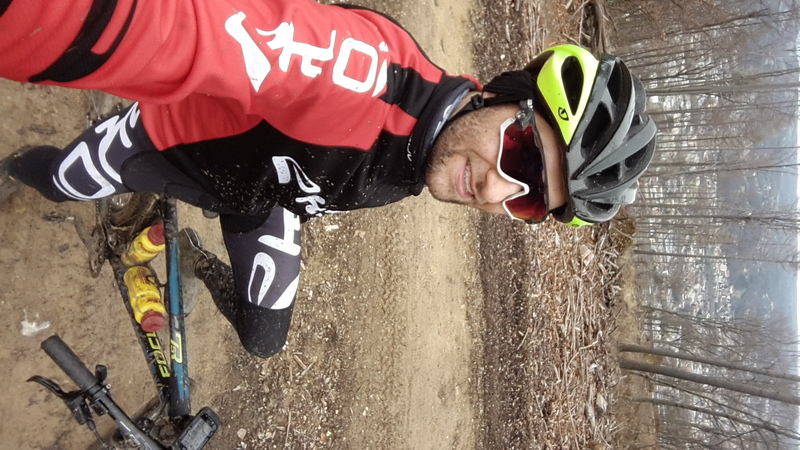 On Saturday morning before the race I had a moment of shock: during the last bike ride before the race I got a flat about six kilometer away from my accommodation. As I did not have any fixing tools with me and I definitely did not want to change the tire, I had to walk the whole way back without shoes. It was not funny at all but I kept thinking: Good that this happens today and hopefully not tomorrow during the race. Another lucky coincident was that it was not that hot and walking on the asphalt did not hurt too much. 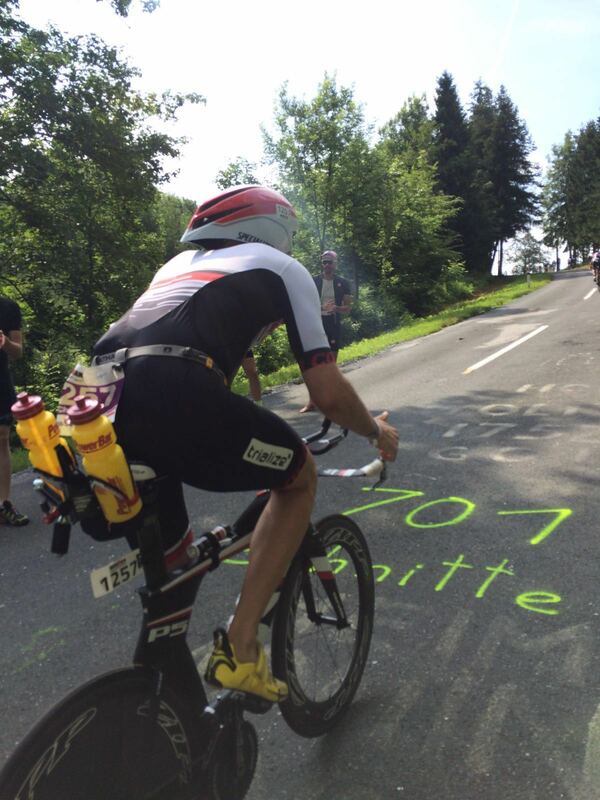 Hopefully I was not even a little bit nervous the days before the Ironman. This did not really change on Sunday. I was just happy that finally the great event was near and all the hard work pays off. 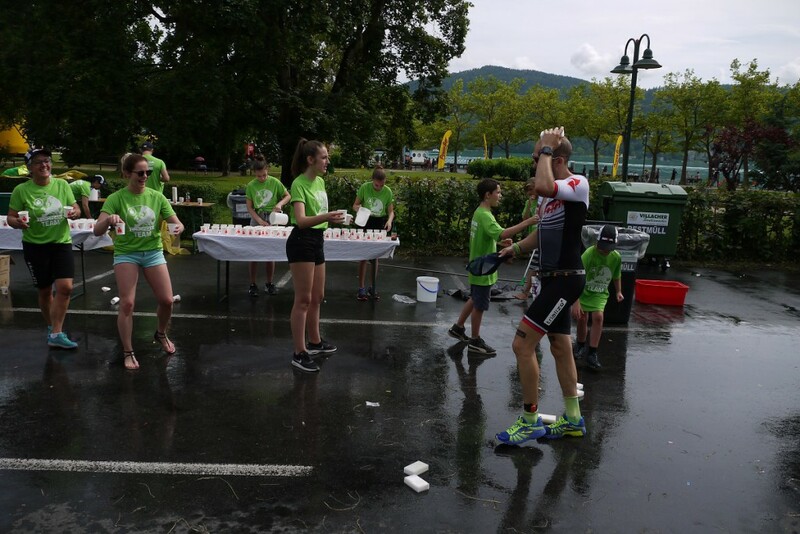 At 6:40 in the morning the pros started their race and at 6:50 the age group race was started with a rolling start (for the first time in Klagenfurt). 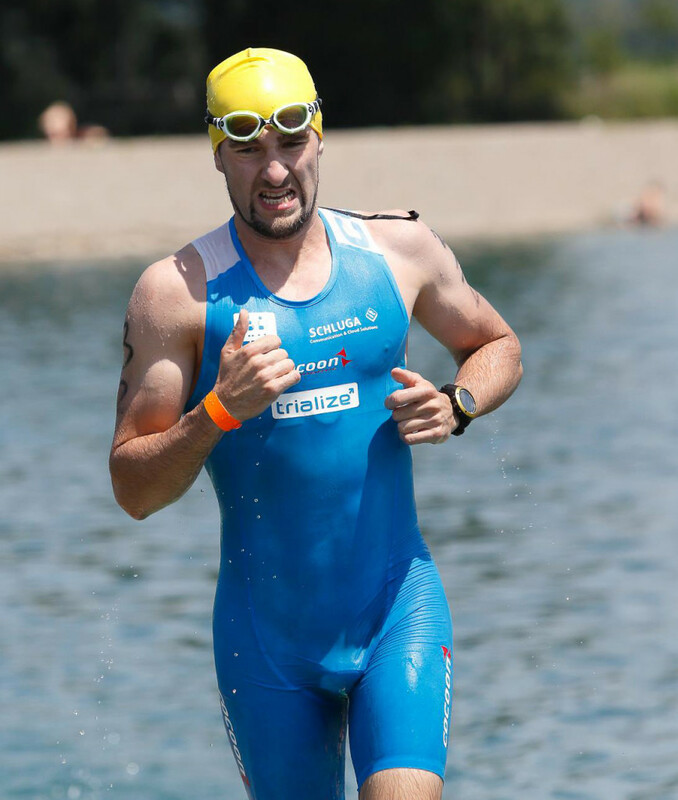 At about 7:00 I went into the water and my first long distance triathlon was on. Already at the beginning I had a very good feeling in the water. It was easy to swim and it felt pretty fast (for myself). There were almost no fights in the water. 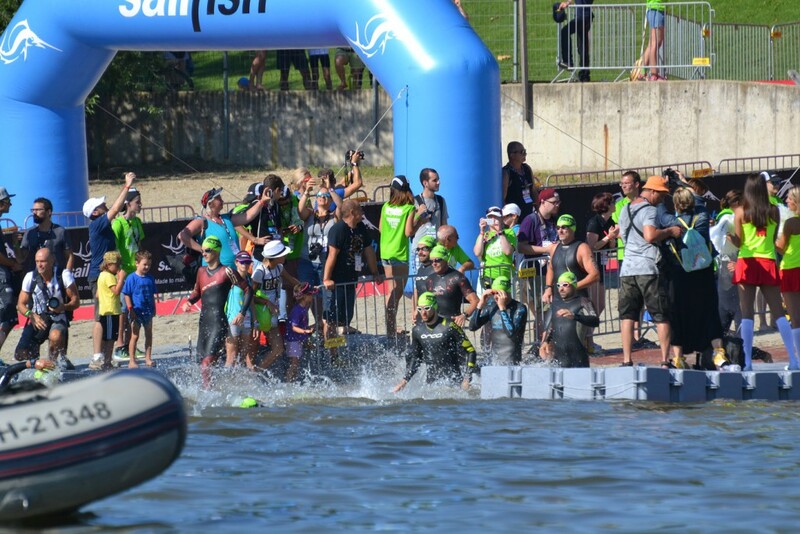 Sometimes in between and of course at the first turning buoy but this was because of the rolling start and the fact that some athletes did not place themselves at the correct spot (which time they are able to swim). The way back to the Lendkanal was pretty though because you hardly could see anything. If you concentrate it was possible to see silhouettes of the buildings and th trees but not much more – just like the coach, Markus Ressler, told us. Even with this circumstances I was able to find my way to the entry into the Lend Kanal without huge indirections. After 1h and 3 minutes I came out of the water and into the transition zone. 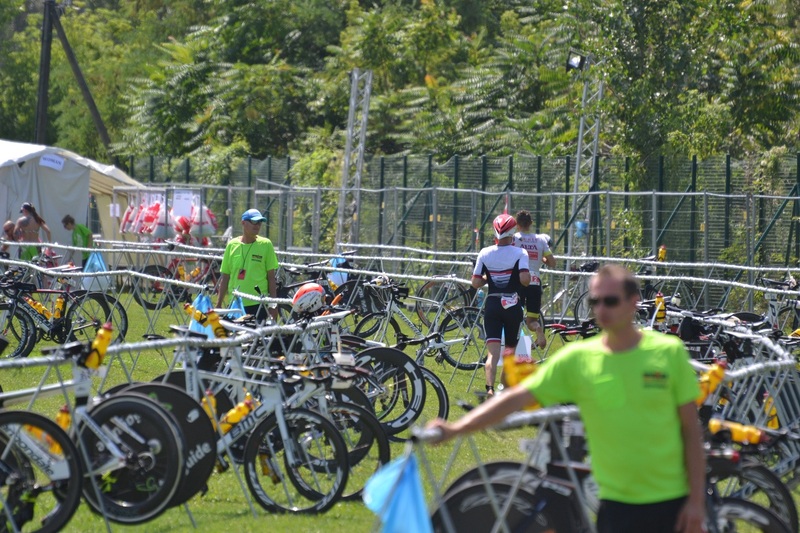 Things worked great for me in the transition zone and I had no problems. 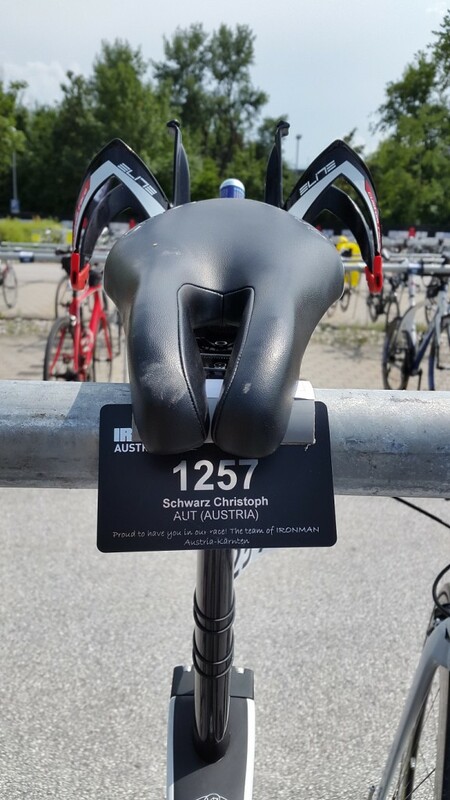 So I started into the first of two 90 kilometer bike laps nearby the Wörthersee. At the side of the road there were a lot of people who made a fantastic atmosphere and pushed every athlete forward. 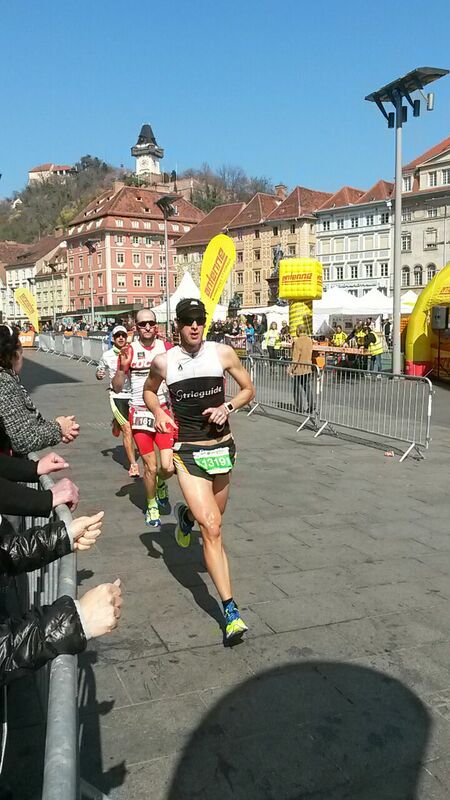 At the Ruperti Berg a Trialize delegation pushed every athletes upwards that difficult part of the course. But there were not as much people as I would have expected. I think in the past it was definitely more fans. After 2 hours and 32 minute I came back to the turning point and started the second lap. Shortly at the beginning I missed my special need bag because I wasn’t really prepared for it. After that my chain felt off the chain ring and I had to stop to put it back on. Now everything went good again, beside the rain that started and held on until I was in the transition zone again. The rain and another break on the Ruperti Berg (for personal need) was the cause why the second lap was a bit slower than the first one (2 hours and 38 minutes). Another unproblematic change and the marathon was on. My plan here was to keep a pace of 5:00/km up to being able to finish with around 3 hours 30 minutes and overall in sub 10 hours. 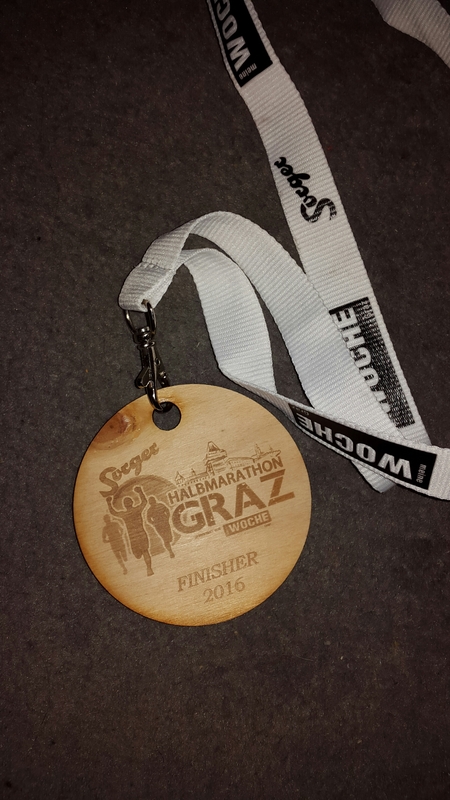 During kilometer 12 a recognised that my plan might not work out as expected, at least my marathon plan. I still tried to believe that sub 10 is possible and also tried not to think too much about it. But the last 20 kilometers were horrible I walked through the nutrition zones and ate a gel everywhere. In between the stations I tried to run but still with a slower pace than 5:00. 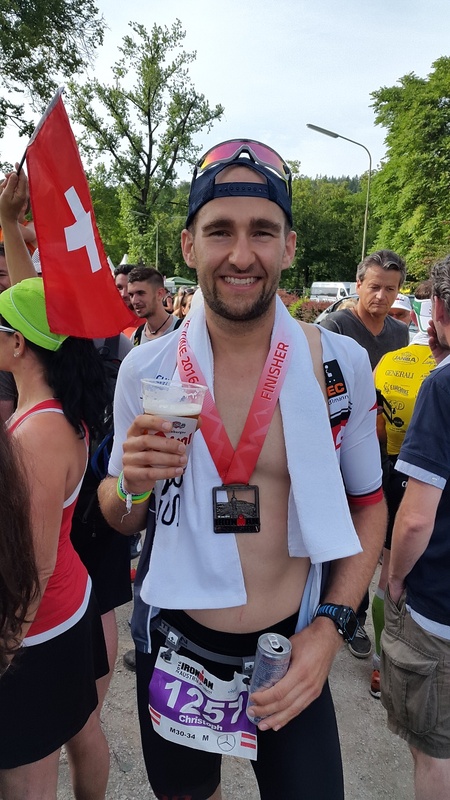 In the end I finished my first Ironman which was my primary goal. My time was 10:08:54 which is quite ok and I think I have still room to improve. Thanks for everyone who pushed me forward on the bike and on the run. Congratulation to all the finisher I think it was not easy for anybody. Many thanks to Laura and also Pascal for the great pictures. Now it is time for regeneration and getting focused onto the next events and goals. Further results can be found here. 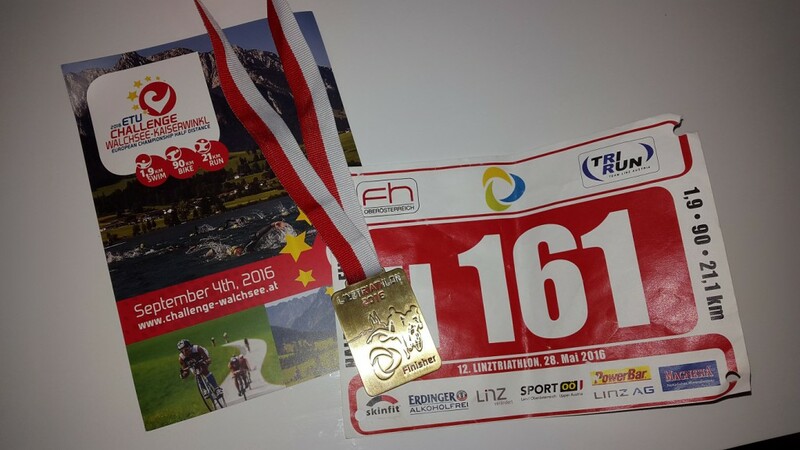 On Saturday the Linztriathlon 2016 was on my competition plan which was also my rehearsal for the Ironman in Klagenfurt. I was going to compete over the halfiron distance and my goal this time was to make a good overall race where I can be satisfied with the result in all disciplines. On the start I felt very confident and during the swim I was able to get into my rhythm at the first buoy although there were the usual brawls at the beginning. 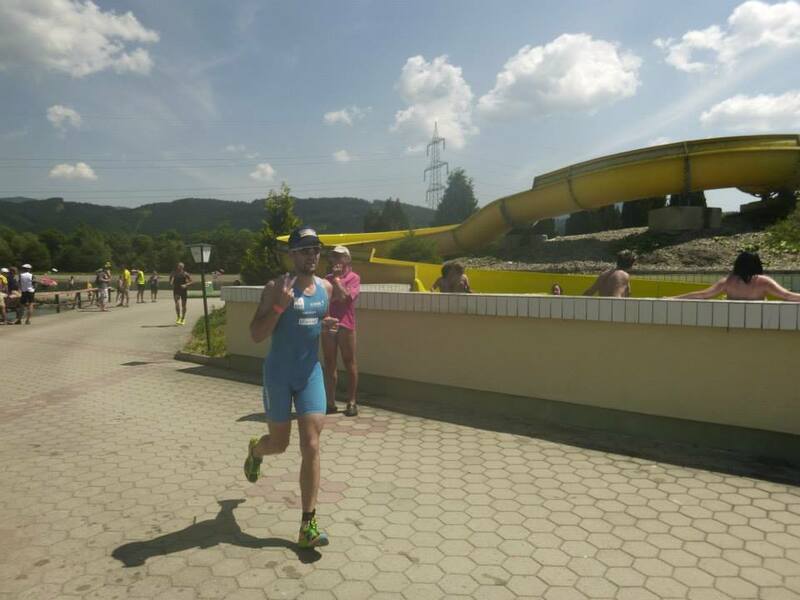 Already before the start I recognised that my swim cap did not fit onto my head – maybe because of the sun cream. Finally at the third buoy my swim cap disappeared from my head and I had to finish without a cap. 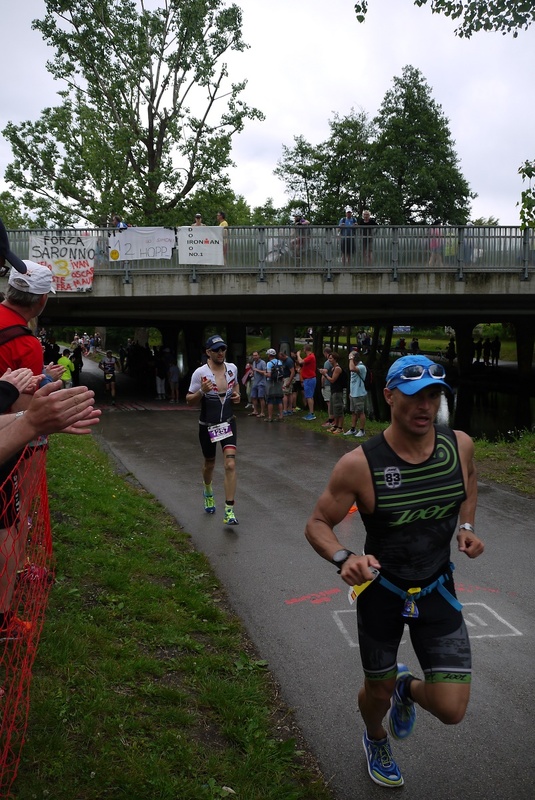 After 31 minutes and 10 seconds I came out of the Pleschingersee and into the transition zone. Run into the transition zone. Foto © by Tri Your Life. After a very quick and almost perfect transit the bike split was ON. 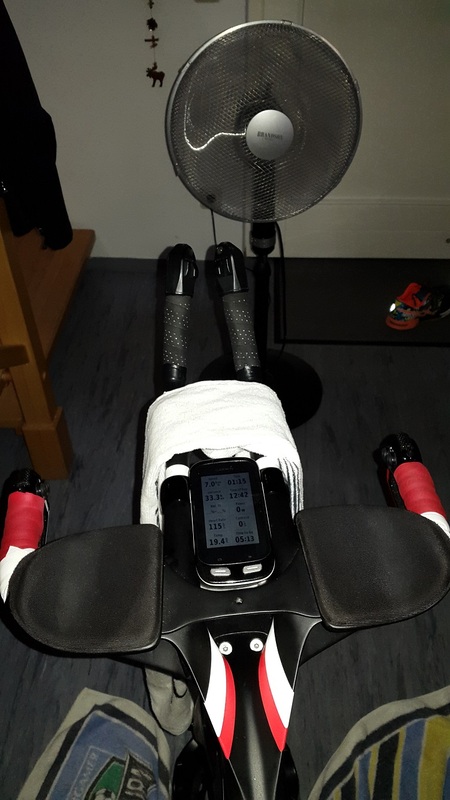 My plan was not to risk too much on the bike to be able to run a good halfmarathon. Looks pretty fast on the bike. Foto © by Tri Your Life. But I realized pretty soon that my plan will not hold as I was too enthusiastic and pushed too hard even on the first lap. I finished the first 45km lap within 1 hour and 15 seconds – at that time I knew that I might have risked a good halfmarathon during this competition. 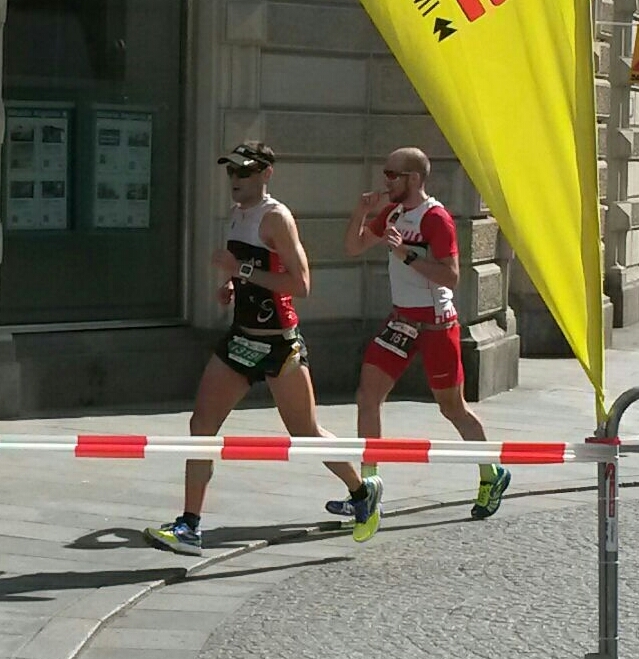 Nevertheless, I pushed hard on the bike and came into the transition zone after 2:30:50. On the first meters of the halfmarathon I felt a bad pain on the right hand side of my hamstring. After eating a gel the pain was gone within a sudden. I was able to run the first lap with 4:30/km. After that I was kicked back on the second lap with 5:00/km. I came back in lap three and four although the temperatures were very tough. All in all I finished in the halfmarathon in 1:42:18. At the end I finished my first half ironman in 4:47:50 at the 45th place overall and 18th in age-group 30-39. Although I was not able to perform the half marathon as expected I am very satisfied with this overall result as I have improved my personal best on the halfiron distance by 12 minutes. 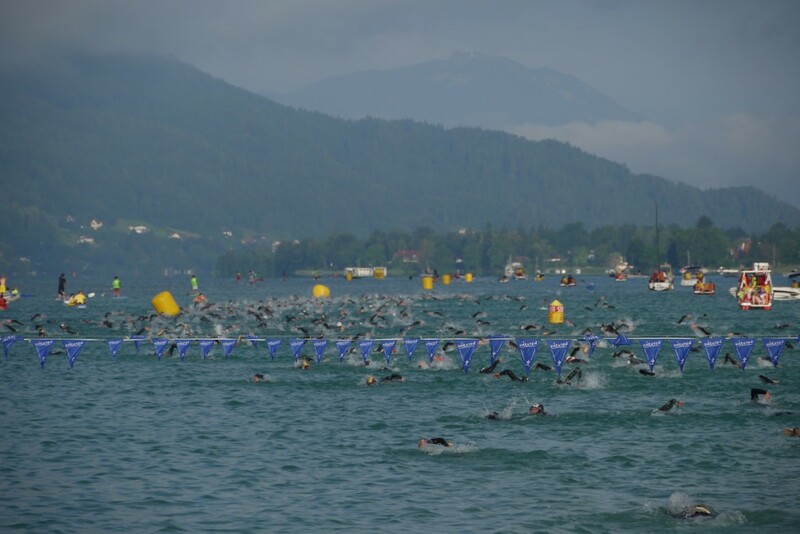 Additionally I could qualify myself for the ITU european championship in Walchsee this year. Further results please see here. On Sunday the 20th of March the first competition of season 2016 was on the plan. I wanted to see what effect my winter training has had. My goal was to improve my personal best in half marathon, which should definitely be possible from the point of my training’s results. 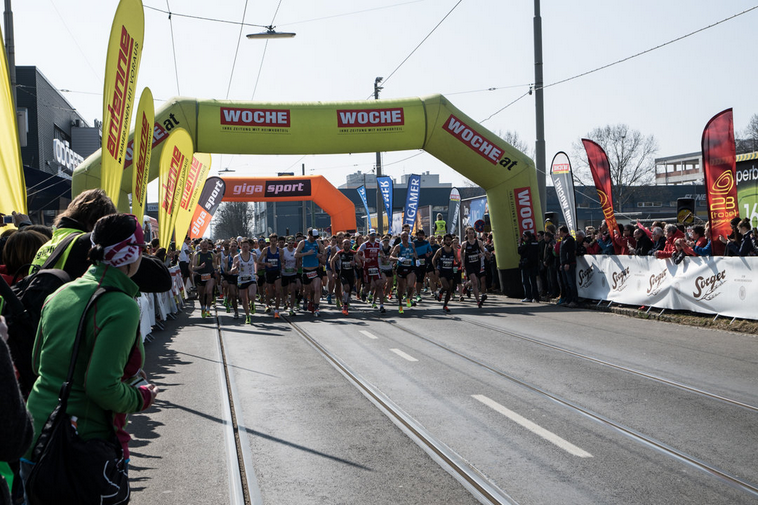 The course was three laps on a 7 km circuit into the center with the start in the Herrgottwiesgasse. 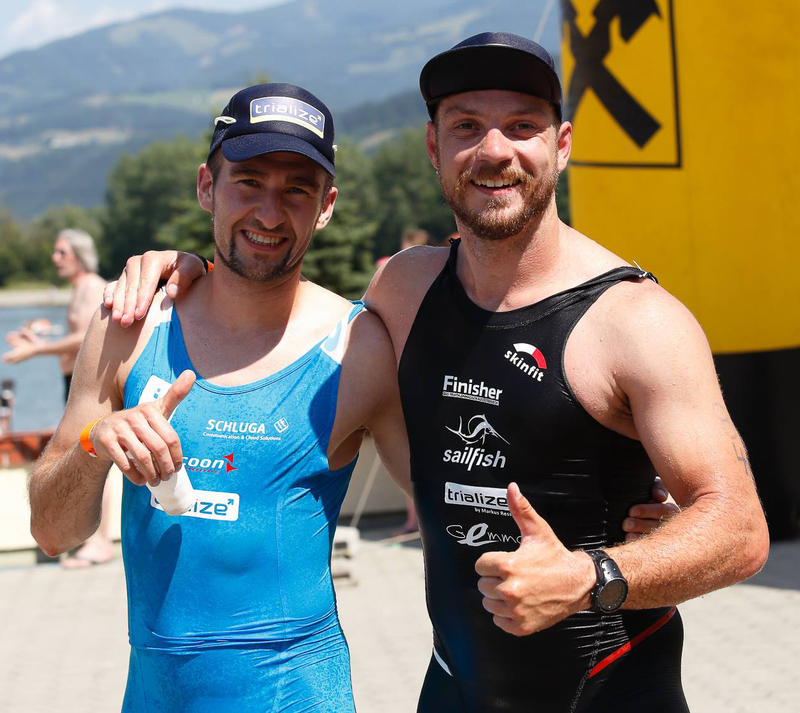 I started with a pace of 4:00/km and was able to keep this pace up for the whole race – also because I have met Andreas Wünscher during the race and we could run together. At the end I have improved my personal best half marathon time by 11 (!!!) minutes and finish with a time of 1:25:09. This time put me onto the 32nd rank within my new age group AK30 and on the 60th rank overall. Many thanks to Laura for the great pictures and to all the spectators as well as colleges who supported me and pushed me to that great performance. 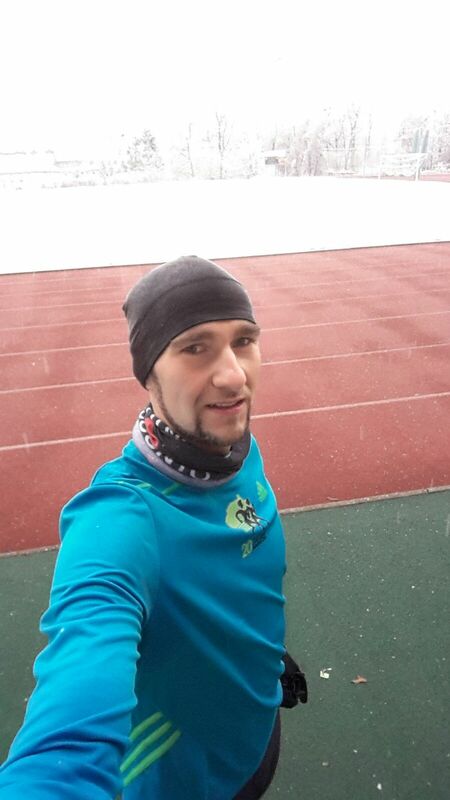 Today started early with a morning running session on the track of USZ Rosenhain. Cold temperatures and light snow in an idyllic winter wonderland made the running much easier at this time. Meanwhile most of the triathletes are already preparing themselves in warmer climates a used the weather for having some fun in the mud in the suburbs of Graz. Mud all the way your lookin’ at. The view was not fantastic at all this morning. 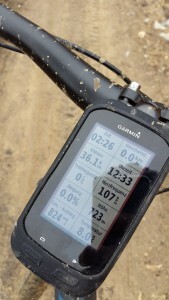 It was a great three-hour ride followed by a 30 minutes run this morning. 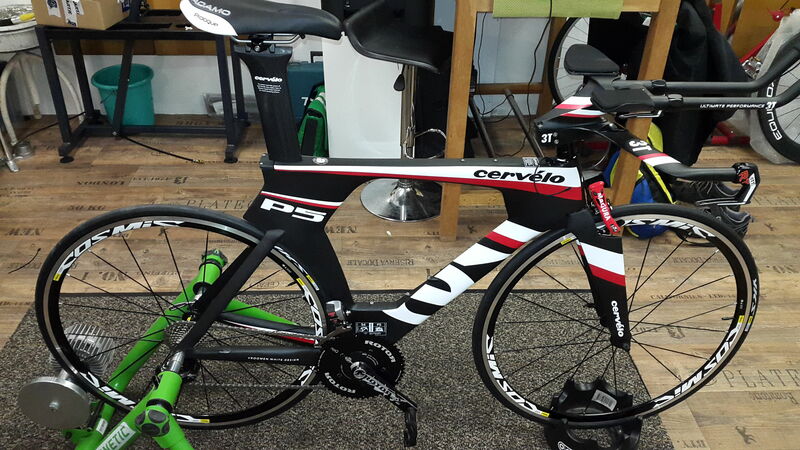 Finally at the end of this yearI have seen my new Cervelo P5 for the very first time in real and of course did the bike fitting at Knapp Andreas site. After I have the bike at home I will present you some more pictures. Many thanks to Andreas for building up the bike. This week’s motto was regeneration to get some energy for the next challenges. 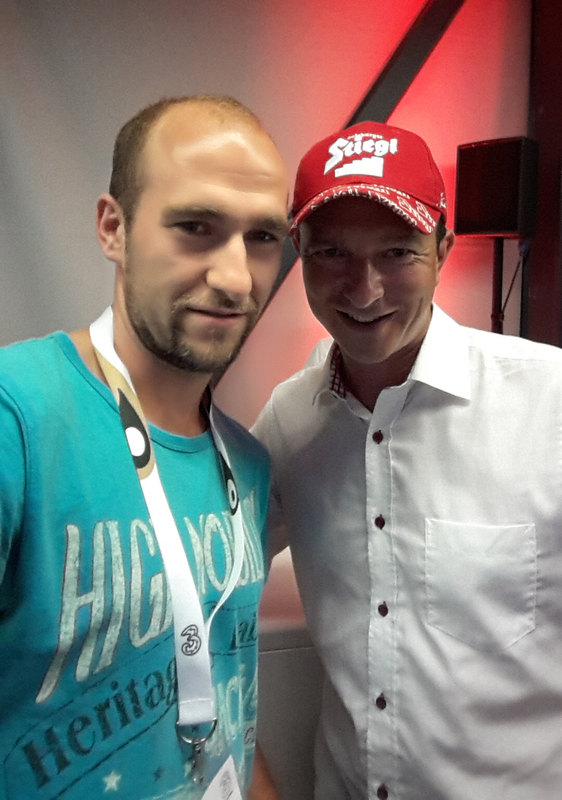 Additionally I had the possibility to go to a talk of the former nordic ÖSV ski-jumping coach Alexander Pointner. 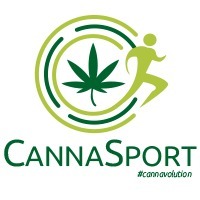 Thank’s very much for the interesting views into the world of professional sports. Preparations for Obertrum are ongoing, hopefully I can see some of you there. No need for warm-up at this temperatures! 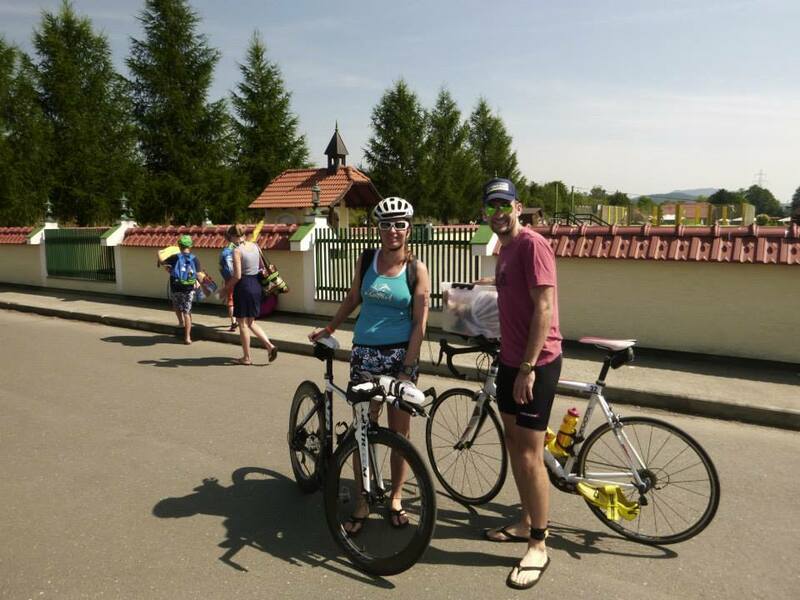 Last Sunday the Zechner X-Trim triathlon over the olympic distance was on my schedule. The weather was perfect to get a feeling of how it could be in Obertrum in two weeks if it the conditions are the same as last year. 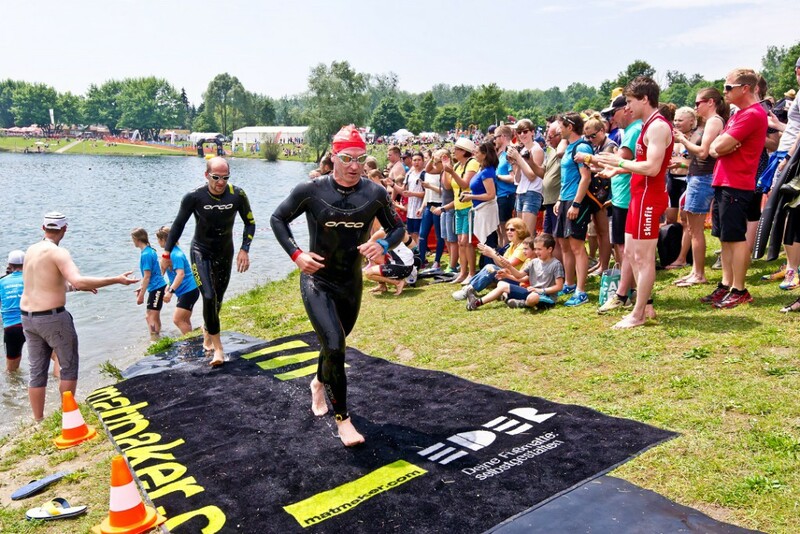 At 35°C air and 24°C water temperature there was no question whether the two laps in the pond have to be done with or without wetsuit. Unfortunately my goggles became foggy a short time after the start and I had problems on finding the buoys. Nevertheless, I made it to the transition zone after about 25 minutes. At the swim exit after the two laps. 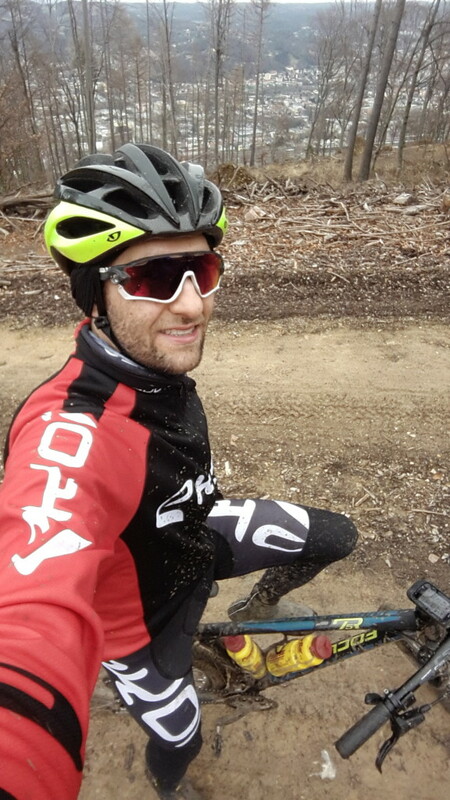 A little mistake in the transition area (could not find the exit immediately) I got into a very good flow on the bike. On the highway the speed was very good which had also a nice cooling effect. But after the turn up to Feistritz and Hof it was really hard to ride and it did not feel good at all – Ø 277W at 25,7km/h speaks volumes! 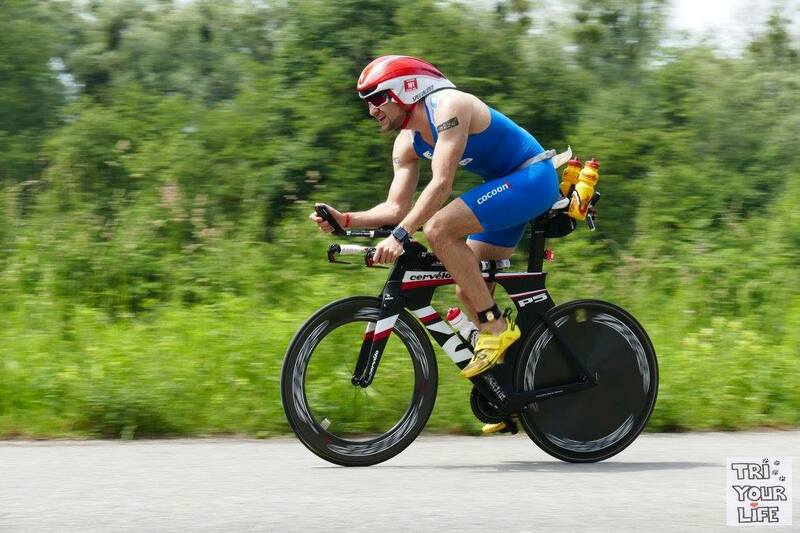 All in all I was satisfied to get off the bike after 40km with a split time of 1:07:43. This time the transit from bike to run was without any error. 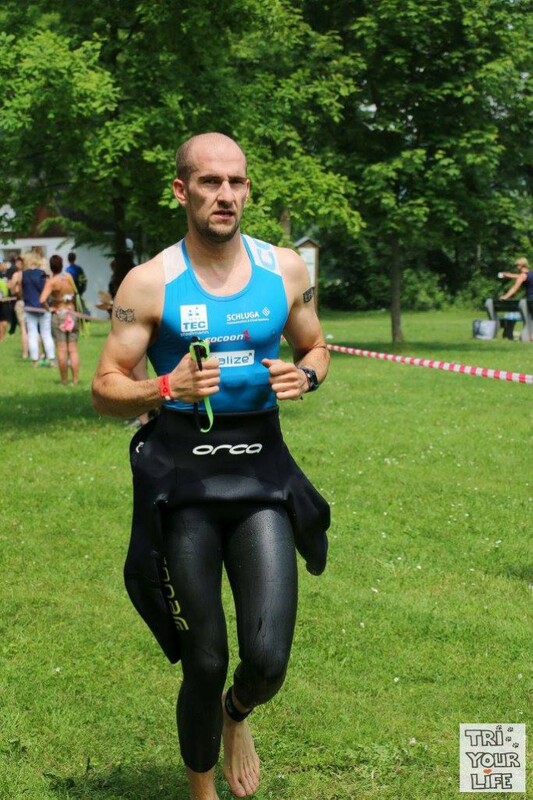 During the run I thought all the time that it would be much more comfortable to jump into the pond instead of running four laps each 2,5 km on the waterside. At this point a huge “Thank you” to all the helpers at the nutrition zone as well as to the ladies at the shower! Second of four laps done – two more to go! I finished my first olympic distance of this year in 2:16:28 on the 25th place in overall ranking and 8th in my age group. I am really happy about this result because I did my best and secondly because I really was not sure how I am able to perform at this conditions. Happy with Martin after finishing – congratulations well done! Further results please click here.